The movie proceeds in flashback, telling the story of Kane, as seen from the perspective of friends, enemies, ex-wives and former employees, with the pieces of the puzzle slowly falling into place. 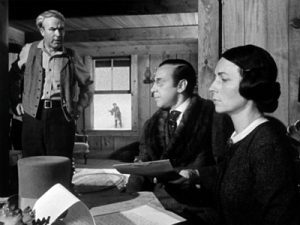 By the end of the movie, the audience knows who Kane was, the tragedy of his life, and about ‘Rosebud’—although none of the movie’s characters do. It’s a fine movie, well deserving of it’s reputation, and definitely worth watching. Arguably the greatest of American films, Orson Welles’s 1941 masterpiece, made when he was only 26, still unfurls like a dream and carries the viewer along the mysterious currents of time and memory to reach a mature (if ambiguous) conclusion: people are the sum of their contradictions, and can’t be known easily. 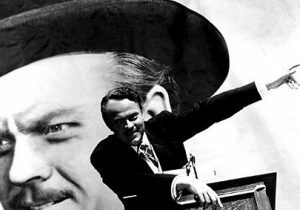 Welles plays newspaper magnate Charles Foster Kane, taken from his mother as a boy and made the ward of a rich industrialist. The result is that every well-meaning or tyrannical or self-destructive move he makes for the rest of his life appears in some way to be a reaction to that deeply wounding event. Charles Foster Kane (Orson Welles): Rosebud. Female reporter: If you could’ve found out what Rosebud meant, I bet that would’ve explained everything. Thompson: No, I don’t think so; no. Mr. Kane was a man who got everything he wanted and then lost it. Maybe Rosebud was something he couldn’t get, or something he lost. Anyway, it wouldn’t have explained anything… I don’t think any word can explain a man’s life. No, I guess Rosebud is just a… piece in a jigsaw puzzle… a missing piece. Kane’s Father: A good whuppin’s all the kid really needs. Mary Kane(Agnes Moorehead): That’s why I’m sending him where you can’t get at him. Charles Foster Kane (Orson Welles): You know, Mr. Bernstein, if I hadn’t been very rich, I might have been a really great man. Walter Parks Thatcher: Don’t you think you are? Charles Foster Kane (Orson Welles): I think I did pretty well under the circumstances. Charles Foster Kane (Orson Welles): Everything you hate. Charles Foster Kane (Orson Welles): Hello Jedediah. Charles Foster Kane (Orson Welles): Sure, we’re speaking, Jedediah: you’re fired. Charles Foster Kane (Orson Welles): I always gagged on the silver spoon. Bernstein (Everett Sloane): Harvard, Yale, Princeton, Cornell, Switzerland… he was thrown out of a lot of colleges. Charles Foster Kane (Orson Welles): – -what I tell them to think. Bernstein (Everett Sloane): President’s niece, huh? Before Mr. Kane’s through with her, she’ll be a president’s wife. Bernstein (Everett Sloane): There’s a lot of statues in Europe you haven’t bought yet. Charles Foster Kane (Orson Welles): You can’t blame me. They’ve been making statues for some two thousand years, and I’ve only been collecting for five. Bernstein (Everett Sloane): We never lost as much as we made. Charles Foster Kane (Orson Welles): The news goes on for 24 hours a day. Charles Foster Kane (Orson Welles): We have no secrets from our readers. Mr. Thatcher is one of our most devoted readers, Mr. Bernstein. He knows what’s wrong with every issue since I’ve taken charge. Jedediah Leland (Joseph Cotten): You still eating? Charles Foster Kane (Orson Welles): I’m still hungry. Charles Foster Kane (Orson Welles): You’re right, I did lose a million dollars last year. I expect to lose a million dollars this year. I expect to lose a million dollars *next* year. You know, Mr. Thatcher, at the rate of a million dollars a year, I’ll have to close this place in… 60 years. Jedediah Leland (Joseph Cotten): Bernstein, am I a stuffed shirt? Am I a horse-faced hypocrite? Am I a New England school marm? Charles Foster Kane (Orson Welles): How did I find business conditions in Europe? With great difficulty. Charles Foster Kane (Orson Welles): I run a couple of newspapers. What do you do? Boss Jim Gettys: I am not a gentleman. I don’t even know what a gentleman is. Charles Foster Kane (Orson Welles): Don’t believe everything you hear on the radio. Bernstein: A fellow will remember a lot of things you wouldn’t think he’d remember. You take me. One day, back in 1896, I was crossing over to Jersey on the ferry, and as we pulled out, there was another ferry pulling in, and on it there was a girl waiting to get off. A white dress she had on. She was carrying a white parasol. I only saw her for one second. She didn’t see me at all, but I’ll bet a month hasn’t gone by since that I haven’t thought of that girl. Charles Foster Kane (Orson Welles): That’s a mistake that will be corrected one of these days. Walter Parks Thatcher: You’re too old to be calling me Mr. Thatcher, Charles. Charles Foster Kane (Orson Welles): You’re too old to be called anything else. Charles Foster Kane (Orson Welles): As Charles Foster Kane who owns eighty-two thousand, six hundred and thirty-four shares of public transit – you see, I do have a general idea of my holdings – I sympathize with you. Charles Foster Kane is a scoundrel. His paper should be run out of town. A committee should be formed to boycott him. You may, if you can form such a committee, put me down for a contribution of one thousand dollars. Charles Foster Kane (Orson Welles): Read the cable. Charles Foster Kane (Orson Welles): Are we going to declare war on Spain, or are we not? Jedediah Leland (Joseph Cotten): The Inquirer already has. Charles Foster Kane (Orson Welles): You long-faced, overdressed anarchist. Jedediah Leland (Joseph Cotten): I am not overdressed. Charles Foster Kane (Orson Welles): You are too. Mr. Bernstein, look at his necktie. Susan: Forty-nine thousand acres of nothing but scenery and statues. I’m lonesome. Charles Foster Kane (Orson Welles): I don’t think there’s one word that can describe a mans life. Reporter 1: Twenty-five thousand bucks. That’s a lot of money to pay for a dame without a head. Rawlson: It isn’t enough to tell us what a man did. You’ve got to tell us who he was. Charles Foster Kane (Orson Welles): Don’t worry about me, Gettys! Don’t worry about me! I’m Charles Foster Kane! I’m no cheap, crooked politician, trying to save himself from the consequences of his crimes! Charles Foster Kane (Orson Welles): Gettys! I’m going to send you to Sing Sing! Sing Sing, Gettys! Sing Sing! Bernstein: [to Leland] Mr. Kane is finishing the review you started – he’s writing a bad notice. I guess that’ll show you. Kane: [pleading] Don’t go, Susan. You mustn’t go. You can’t do this to me. Susan: I see. So it’s YOU who this is being done to. It’s not me at all. Not how I feel. Not what it means to me. [laughs] I can’t do this to you? [odd smile] Oh, yes I can. Jedediah Leland (Joseph Cotten): You just don’t know Charlie. He thought that by finishing that notice he could show me he was an honest man. He was always trying to prove something. The whole thing about Susie being an opera singer, that was trying to prove something. You know what the headline was the day before the election, “Candidate Kane found in love nest with quote, singer, unquote.” He was gonna take the quotes off the singer. Jedediah Leland (Joseph Cotten): That’s all he ever wanted out of life… was love. That’s the tragedy of Charles Foster Kane. You see, he just didn’t have any to give. Charles Foster Kane (Orson Welles): A toast, Jedediah: to Love on my own terms. Charles Foster Kane (Orson Welles): You can’t buy a bag of peanuts in this town without someone writing a song about you. Stagecoach Driver / Hauler: There ain’t no bedrooms in this joint, that’s a newspaper building! Bernstein: You’re getting paid, Mister, for opinions or for hauling? Raymond: Throw that junk in. Reporter: [at beginning of news reel on Charles Foster Kane’s death] In Xanadu did Kubla Khan a stately pleasure-dome decree. Jedediah Leland (Joseph Cotten): I suppose he had a private sort of greatness, but he kept it to himself. Susan: I don’t know many people. Charles Foster Kane (Orson Welles): I know too many people. I guess we’re both lonely.